Talent has quickly become the new currency for what makes companies win or lose. 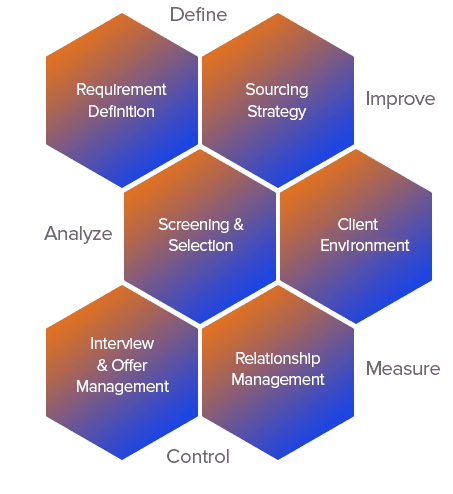 CGS Business Solutions has developed a Quality Engagement Process that outlines key areas in the sourcing, screening and hiring process. Based upon Six Sigma principals of defining, measuring, analyzing, improving and controlling; CGS has architected their CRM and ATS systems to encourage and support a successful engagement for both candidates and customers. Our process goes past skills on a resume. We dive deep into the tangible & intangibles that are key critical in a perfect fit candidate. Our network and reach goes beyond traditional online channels. With access to deep and untapped networks, we accelerate the sourcing process to secure the most skilled talent fast. We’ve screened and now it’s time for the moment of truth. Making that perfect match between candidate and employer. CGS Business Solutions is committed to helping our customers build and maintain a diverse workforce that continues to drive innovation– a critical component to your businesses. If your business is looking for a partner who is committed to attracting and retaining qualified talent from diverse backgrounds and creating a work environment that values every individual for his or her distinctive skills, experiences, and perspectives- choose CGS.